In his book, The Harbinger , Jonathan Cahn argues for a direct connection between what has happened in America since 9/11/2001 and what happened to ancient Israel based on what he believes is a template of God’s judgment in Isaiah:9:10. 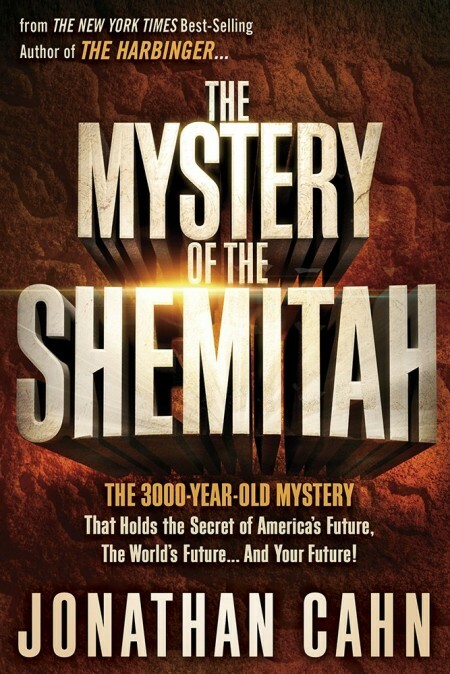 In the chapter titled “The Shemitah,” Cahn argues that he has discovered the mystery of the Shemitah , which he claims is now affecting the United States. In the Law of Moses, God commanded Israel to observe the seventh day of the week as a day of rest, and they were also to observe a Sabbath year, called the Shemitah , as a year of rest. Every seventh year there was to be no planting, reaping, or any other work in the fields. In addition, all who owed money to creditors were to be “released” (the meaning of Shemitah) from their debts (Dt 15:1-2). In turn, God promised to provide enough in the sixth year to more than meet Israel’s needs during the seventh year (Lv 25:20-21). If Israel failed to keep His commandments, however, including the Sabbaths, the Lord warned: “I will scatter you among the nations and draw out a sword after you; your land shall be desolate and your cities waste….Then the land shall rest and enjoy its Sabbaths…for the time it did not rest…when you dwelt in it” (Lv 26:33-35). Centuries later, Israel experienced precisely this judgment because they had abandoned God’s laws and turned to pagan gods. Because Judah had not observed the Shemitah for seventy cycles, God sent the nation into captivity for seventy years. This imposed Shemitah judgment was very specific and involved only the nation of Israel . Since no Gentile nations were ever obligated to keep the Shemitah, there is no scriptural basis for suggesting that any other nation would ever experience an imposed Shemitah judgment. Yet, this is precisely what Jonathan Cahn suggests that America has experienced. Although Israel was on a seven-year economic cycle, no biblical passages support Cahn’s idea that natural economic cycles of seven years exist for nations in general. Furthermore, financial experts have not identified any seven-year economic cycle. There is no scriptural basis for interpreting recent events as a sign that God is imposing a Shemitah judgment on the United States or the world. Even if America were in the very midst of God’s judgment, there are no passages that connect any signs to a Shemitah-type judgment for any nation but Israel. In ancient Israel, the Israelites were not to work the land at all, and wealthy lenders were required to forgive debts owed to them. Then, when Israel turned from God, He imposed the Shemitah on Israel by sending the nation into captivity, collapsing the entire economy. Everyone lost everything. Cahn goes to great lengths in trying to show from the Bible and history that God has imposed a Shemitah upon America, and yet he fails because nothing has happened in America that even roughly parallels Israel’s being forced to leave the land completely fallow. Similarly, a study of the credit and debt situation reveals nothing indicating that America’s economy is under judgment as Israel’s was. Cahn tries to support his claims based on the failure of a few large financial institutions (Fannie Mae, Freddie Mac, Lehman Brothers, and AIG). However, even though these were significant factors in the economic crisis of 2008, this doesn’t follow “the ancient pattern” when Israel was invaded and overrun by a foreign army with everything of value being destroyed or carried away. In sharp contrast, what America suffered on 9/11 was relatively minor when compared to Israel’s complete destruction. Even though the US and global economies went through a serious contraction and many people were hurt financially, it wasn’t close to the scale of the devastation in ancient Israel. The fact is that Wall Street did not collapse, and the global economy did not implode. They were seriously damaged, but they simply did not collapse. And though the Lehman Brothers failure was staggering in terms of dollars, if their assets and debt are added together, the $1.25 trillion represents only 0.6 percent of the world economy and is exceedingly insignificant when compared to what happened when God imposed a seventy-year Shemitah upon Israel. Cahn continues to try to make his case by citing the September 29, 2008, stock market crash as the “greatest single-day stock market crash in Wall Street history.” Although it was the largest point drop , it wasn’t close to the biggest percentage drop, which is the only thing that matters. In ancient Israel, everything was wiped away, which is not what happened to America. And though the Dow Jones did drop 7 percent, Cahn fails to mention that this doesn’t even rank in the top ten drops in terms of percentages. The Dow did drop about 25 percent in the two weeks following the defeat of a bailout bill on September 29, but even this doesn’t rank in the same league as the 1929 market collapse. At that time, not only did it fall 48 percent in just over two months, but by the end of the crash, stocks had lost 90 percent of their value. Even the Great Depression was not of the same relative magnitude as what ancient Israel experienced. How can Cahn maintain that all credit and debt from 2001 to 2008 had “in effect, been canceled?” Of course, there were losses, but nowhere close to all debt was wiped away. If all debt had been wiped away, those who found themselves in upside down mortgages could have kept their homes and owed nothing. Furthermore, although the biblical Shemitah involved the cancellation of all debt, Cahn has redefined it to include the wiping out of savings and investments . But in fact the world’s economy did not collapse. Cahn goes on to point out that September 29, 2008 was also the 29th of Elul on the Hebrew calendar, the end of the year, according to Hebrew reckoning, when all debts among the Jewish people are to be forgiven according to the Shemitah laws. He further notes that seven years earlier on Elul 29 (September 17, 2001, on the Gregorian calendar) the largest stock market crash up to that time happened in the wake of 9/11. Admittedly the timing is interesting, but is it significant? Fannie Mae and Freddie Mac collapsed on September 7. Lehman Brothers’ stock dropped 45 percent on September 9 and announced a $4 billion dollar loss on September 10. And then on September 11, Lehman’s stock “took a second precipitous plunge.” But why is September 11 considered the significant date and not September 15, when Lehman Brothers filed for bankruptcy? Or why not September 9, when the drop started? Or why not September 7? Cahn’s argument is arbitrary and seems to be “cherry-picking” evidence to strengthen his case while ignoring related evidence that does not support or undercuts his arguments. Of course, the number seven clearly has special significance throughout the Bible, but this is not the issue. The fact is that the above numbers come from a very large universe of statistics that includes many different numbers. Using this method, the author could have been trying to prove any number from zero through nine and found the evidence he was looking for. In trying to demonstrate the validity of the “mystery of sevens,” Cahn appeals to what he says are very precise numbers. Therefore, if precision is claimed to prove God’s involvement, the numbers actually do need to be precise. Anything less proves nothing more than an interesting coincidence. The first issue is the supposed sign of the 777-point drop on September 29, 2008. Late that day, CNNMoney.com reported the drop as 778 points. This was because the actual figure was 777.68 points. If the Lord were trying to draw attention to what He was doing, causing the drop to be precisely 777.77 or 777.00 certainly would be no more difficult for Him than 777.68. But as it is, the actual figure is just another number. Furthermore, while the DOW is important, the NASDAQ and S&P 500 indices are also significant indicators, and they fell 9.1 percent and 8.8 percent respectively. Would it have also been a sign from God if the DOW had fallen 8 percent but the NASDAQ had fallen 7 percent? And, in fact the drop was not exactly 7.0 percent. Rather, it was 6.98 percent. Though this may seem nit-picky, when the basis for one’s arguments is precise numbers, they need to be precise. Would it also have been a sign if the numbers were 6.51 percent or 7.49 percent? How much could it be off and still be a sign? How difficult would it have been for God to cause a drop of exactly 7.0 percent? Or better still, 7.7 percent, or even 7.77 percent? If someone claims to be able to discern what God has done based on precise numbers, then precision should be expected. Yet the degree of Cahn’s “precision” is both arbitrary and inconsistent. The numbers are interesting—but not amazing and clearly not the sure signature of the hand of God. The historical evidence for a Shemitah judgment is just not there. Although the above strongly mitigates against Cahn’s theory that God has imposed a Shemitah on the United States, the theological problem of proposing that God is using the Shemitah as a principle for nations other than Israel is even greater. The Sabbath day and the Sabbath year, the Shemitah, were exclusively part of the Law of Moses. If God had any expectations with regard to the Sabbath day or a seven-year economic or agricultural cycle apart from the Law, there would be corresponding revelation. However, the Scriptures are silent on this, both before and after the Law, and they never involved any nation except Israel. , 8-10). Therefore, because Christ fulfilled the Law, God does not impose a Sabbath day or a Sabbath year (the Shemitah) upon believers. Nor does God any longer expect Jews or any nation to continue keeping the Sabbath day or Shemitah. Rather, His desire is that all would enter His Sabbath rest through faith in Christ. There is no biblical basis whatsoever for Cahn’s theory concerning an imposed Shemitah. Quite the opposite is true—his theory runs counter to the Word of God and the gospel. Jonathan Cahn’s suggestion that America may be under an imposed Shemitah is antithetical to the biblical concept of the Sabbath laws given to Israel alone and the fulfillment of those laws for believers in Christ. This doesn’t mean that God will not judge the nations, including America. This doesn’t mean that His judgment is not already underway. It may very well be—and if so, it is well deserved. However, whatever the judgment is or will be, it is not an imposed Shemitah judgment connected with Isaiah:9:10.